New Chapter Perfect Prenatal Multivitamin, includes targeted levels of whole-food folate, is formulated specifically to nourish mother and baby. Most people would agree that taking a daily multivitamin is a good idea – it’s often referred to as an “insurance policy” for covering nutritional gaps left by a less than optimal diet.New Chapter believes a daily multi can be much more than a nutrient backstop. In fact, they believe their Organic, Whole-Food Multi’s can serve as the foundation of your complete nutrition program – with multiple benefits in support of your overall health and wellness. Expertly formulated prenatal vitamins support preconception, healthy pregnancy & fetal development, with Folate as recommended by OB/GYNS to support healthy development of baby's brain and spinal cord. Gentle even on an empty stomach and uniquely fermented with beneficial probiotics and whole foods. Complete Prenatal Vitamin: 100% daily value of Iron for blood-building support; B Vitamins for natural energy support; Vitamin D3 for heart support; vitamin C, A & Zinc for immune support. For those seeking organic prenatal vitamins, our clean, whole-food ingredients include organic Superfood Sprouts such as Kale, Broccoli & Cauliflower. For prenatal DHA, add New Chapter Wholemega for Moms fish oil. Made with Certified Organic Vegetables & Herbs, Non-GMO Project Verified, Vegetarian, Kosher, Gluten Free, No Synthetic Fillers, No Animals Gelatin (added to some prenatal gummy vitamins. When you're pregnant or planning to be, you're naturally looking for the best organic prenatal vitamins. Nourishing yourself and your baby with the perfect ingredients matters for supporting a healthy pregnancy. But how do you choose between raw, fermented or USP multivitamins, or even prental gummy vitamins? For your peace of mind, New Chapter's whole-food fermented prental vitamins are made with organic, Non-GMO, high quality & premium ingredients from Folate to Iron to Vitamin D3 to supportive vegetables and herbs, to nourish the two of your every step of the way. Moms love that Perfect Prenatal is so gentle you can take it anytime, even on an empty stomach. For prental DHA, add New Chapter Wholemega for Moms fish oil. Cultured Whole Food- Organic herbs and cultured whole-food vitamins & minerals work together to promote a healthy pregnancy and baby – not just address nutrient deficiencies. For Mom & Baby- Perfect Prenatal whole-food multivitamin, including targeted levels of whole-food folate, is formulated specifically to nourish mother and baby. Hormone & Breast Support- A blend of organic broccoli, organic kale, and other organic cruciferous sprouts supports healthy estrogen metabolism and breast health. Convenient- Once-per-meal formula is easy-to-take, easy-to-digest, and can be taken anytime – even on an empty stomach! Our bodies understand and seek organic nourishment, for organic whole foods deliver the ideal form of essential micronutrients that allow us to thrive. Our Earth understands - and celebrates - organic cultivation, which reduces the burden of the toxic "ides" such as pesticides, fungicides, and herbicides. And their organic whole-food complexed vitamins understand and speak your language, the language of life itself. What makes their whole food vitamins and minerals better than conventional supplements? Do any of their products contain dairy? Are all of their products organic? New Chapter takes a ustainable, whole-food approach to vitamins and supplements that deliver industry-leading standards of quality: Every ingredient. Every product. Every time. From concept to bottle, their products are responsibly sourced, expertly formulated, and meticulously manufactured. New Chapter tests for purity, potency and identity with independent third party labs. Our certified organic and Non-GMO Project Verified products go through a detailed credentialing process, and our ingredients are sustainably sourced organic Turmeric from Indai, wild caught Salmon from the clean waters of Alaska, Red Marine Algae from Iceland's pristine coastline. We believe the best way to deliver the healing Wisdom of Nature is through safe, effective, and high quality products made with Earth's pure ingredients. 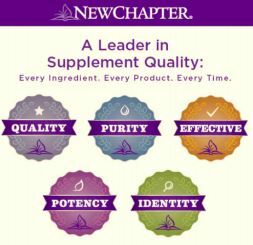 New Chapter's industry-leading quality process ensures you are getting exactly what is listed on their bottles. Every ingredient. Every product. Ever time. Other Ingredients: Culture media (organic soy flour, organic gum acacia, organic Saccharomyces cerevisiae [active and inactive], organic maltodextrin, lactic acid bacteria [L. acidophilus, B. bifidum, L. rhamnosus], organic orange peel powder, organic carrot powder, organic alfalfa powder, papain [deactivated], bromelain [deactivated] and organic safflower oil), organic gum acacia, silicon dioxide, lac resin, carnauba wax and maltodextrin. Caution: As with any dietary or herbal supplement, you should advise your health care practitioner of the use of this product. If you are nursing, pregnant, or considering pregnancy, you should consult your health care practitioner prior to using this product. Discontinue use and contact your healthcare professional if you experience a side effect or an allergic reaction. Do not exceed suggested use. Keep out of reach of children.